"وجعلت فیه لیلة القدروجعلتهاخیراًمن الف شهر"
Imam Hussein (a.s) mosque was the place of crowd of faithful Muslims which were crooning the “Pardon o Allah” and exposing themselves to the grace rays of Allah to be involved in receiving the mercies of the Qadr night. The faithful Muslims started the ceremonies from evening by __having the Iftar and dinner of the spread table of Imam Hussein (a.s) holding the congressional prayers of Maqrib & Isha and getting ready for specific recommended activities of these nights. The words of Hojat-al-Islam Zare’ regarding the personality of Imam Ali ibn Abitalib, supplication and conditions of acceptance of the prayers, mad the attendants get ready to receive the graces of the unlimited Allah’s mercies. By praying the missed prayers of a few days in congressional prayer, reciting the “Joshan Al Kabeer” supplication and around the Sahar time, ayatollah Madani had his words on innocence of Ali ibn Abitalib (a.s) during the three Qadr nights. 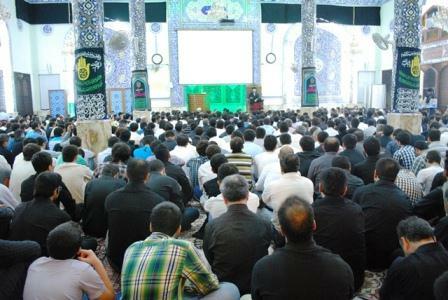 He mentioned that the prayer for Imam al Zaman (a.s)’s health and advance movement is part of Qadr nights recommendations and the attendants stand up to recite the “faraj” supplication and asked for their wishes to become true. In continuation the specific Qura’n on head supplication performed and among that ceremony, attendees were asking their inquiries for their life and after life. In these three nights, before sohoor, Mr. Behtooei performed the panegyrist poems and Muslims were morning for innocent martyrdom of first Shia leader. The Imam Husseiin (a.s) mosque was holding the crowd of faithful Muslims that were reciting and crooning the recommended words and prayers of Qadr nights till dawn.